Furtys couldn’t get any more opioids. His prescriptions dried up in 2012 when he went to rehab. His street supply ended in 2016 when he was arrested and learned about a detox program while in jail. But his pain didn’t stop. While in jail, Furtys read that New York state added post-traumatic stress disorder and chronic pain to the list of debilitating and life-threatening conditions allowed to be treated with medical marijuana. There’s more than anecdotal evidence that individuals being treated for pain are at least considering if not outright choosing medical marijuana over opioids. Nearly twice as many new patients at Columbia Care from 2017 to 2018 said they want to reduce their use of opioids, according to the company that manufactures and dispenses medical marijuana at Eastman Business Park. Dr. Rob Horowitz, chief of the Palliative Care Division at Strong Memorial Hospital, said some patients look horrified when he suggests a fentanyl patch for their pain. “They go, ‘Isn’t that the one that kills everybody?’” Horowitz said. The addictive properties of opioids, the overdoses and less drastic but still real problems such as constipation are well-documented. Furtys started on opioids in 2009 after a back injury while working as a carpenter. He continued on opioids after throat surgery in 2009. He was living with his parents and his mother noticed that in 2012, he still was getting prescriptions. “Shortly thereafter, I was in rehab,” Furtys said. He was prescribed suboxone, but his drug use continued until June 13, 2016, when he was arrested. 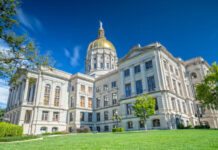 After his release, he said it took him nearly three months to find a provider to certify that his history of PTSD and chronic pain made him eligible for medical marijuana. Furtys is on the board of ROCNorml, a local chapter of the national organization that advocates for the reform of marijuana laws. He is back in school, taking classes at Monroe Community College to be a flight paramedic. He said that was not possible when he was taking opioids. Medical marijuana is legal in about half the states. New York has among the most restrictive law, with providers having to take a state-approved course and register in order to certify patients. Individuals can qualify for medical marijuana if they have been diagnosed with one of 12 debilitating or life-threating conditions. 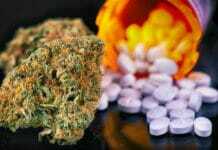 In states with medical marijuana laws, prescriptions for opioids from 2010 through 2015 dropped by about 2 million daily doses per year, according to an analysis of Medicare Part D data reported in the April 2, 2018 issue of JAMA Internal Medicine. The data did not cover private insurance and in New York, medical marijuana is not covered. 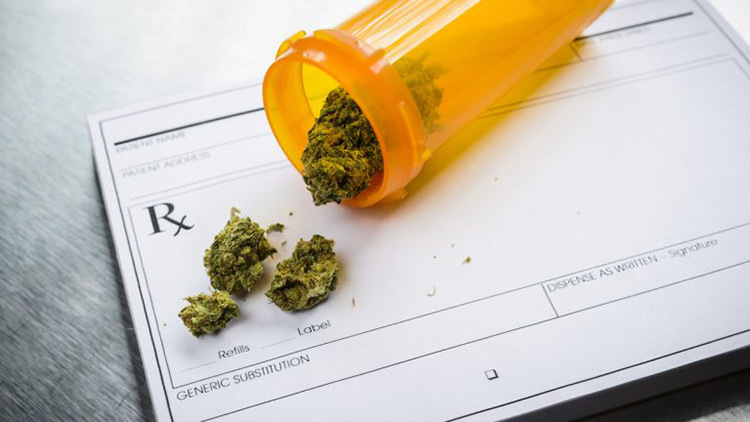 Medical marijuana became available in New York in January 2016. Opioid prescriptions in Monroe County dropped by about 24,000 from 2014 through 2016. But it’s hard to know what role marijuana played in the decrease. Excellus BlueCross BlueShield did not have information about trends in opioid prescriptions for its subscribers readily available. Patricia Kendall, a family nurse practitioner in Brockport, started her own practice and registered to offer medical marijuana after working for years with people in chronic pain. Kendall added her name to the list of practitioners on a public webpage of the state Department of Health. The roster is a fraction of providers who are registered to certify patients. A more robust list of the 1,529 registered providers is on a health department webpage available only to health care practitioners. Dr. Bridgette Wiefling is senior vice president of the Primary Care and Ambulatory Speciality Institute at Rochester Regional Health. She said the system does not have a stand on whether its providers should certify their patients for medical marijuana. “We’re not encouraging or discouraging people at this point,” she said, adding that those who are registered with the state are not breaking any rules. The cannabis plant is best known for THC, which brings on euphoria. 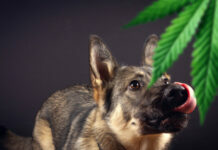 But that plant has many properties and Wiefling, like other physicians, said it’s essential to get more research on how THC and the cannabidiols (CBD) work on pain. In 2017, the National Academies of Medicine released a report on the health effects of cannabis. The report found substantial evidence that compounds in the plant can help with chronic pain in adults, chemo-induced nausea and vomiting and patient-reported spasticity associated with multiple sclerosis. Mazanet said that as of March 2017, about 40 percent of new patients to Columbia Care who were using opioids said they wanted to reduce those drugs. In March 2018, about 70 percent of new Columbia Care patients who were using opioids wanted to cut that medication. Columbia Care, one of 10 licensed companies in New York, is not in states that have legalized recreational marijuana. Its medical products include capsules, tinctures and vapor. New York does not allow smoking.